Martin Young extends an invitation to you to visit his garden and experience his unique range of garden seats - please phone first to make an appointment. 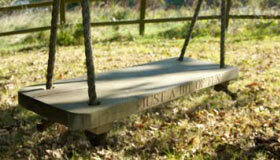 Choose your own inscription for this Garden Rope Swing for the ideal, personalised Christmas gift. Loop the strong, hand-spliced ropes around a sturdy tree branch, then rock to and fro on the oak seat (75cm x 25cm), which ages naturally to an attractive silver. Our policy is to follow the FSC "Chain of Custody" thus ensuring all timber used to make your swing seats is tracked from felling (and subsequent replanting), to sawmill, to shipper, to timber merchant and finally to workshop. We only use Oak, Western Red Cedar and joinery quality softwood Vac-Vac treated.